June 7, 2016 – The shape of a crater can depend on a number of factors, including the angle of impact and the pre-impact slope and topography. The ejecta — the debris that is generated and thrown out by an impact — will typically distribute itself evenly around the outside of the crater rim where the pre-impact surface is flat and the angle of impact is not too low. This image shows a roughly 3-kilometer impact crater formed on the sloping walls of Tithonium Chasma, part of the large Valles Marineris canyon system on Mars. This crater is non-circular, measuring about 3 km by 4 km. Due to the highly inclined nature of the surface here, the ejecta deposited preferentially downslope, forming a tongue-like deposit. 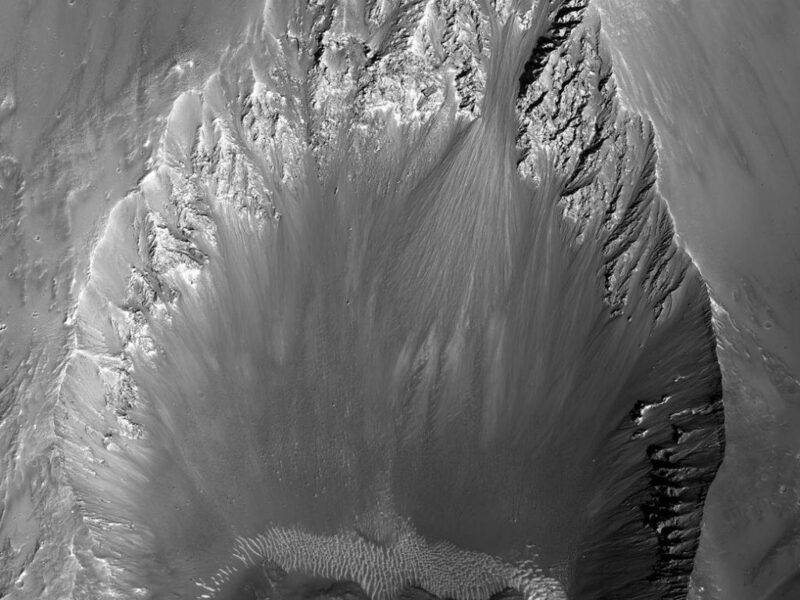 Smooth, dark-toned flow-like features are superimposed on the ejecta blanket and flowing downslope. These are believed to be composed of impact melt — or the mixture of rock and other material that melted upon impact — and flowed down the slope before hardening. These potential impact melt deposits also occur as smooth ponds, which pooled on the surface of a portion of the ejecta that did not escape the crater interior. This image was taken on March 6, 2016, at 15:10 local Mars time by the High Resolution Imaging Science Experiment (HiRISE) camera on NASA’s Mars Reconnaissance Orbiter. The University of Arizona, Tucson, operates HiRISE, which was built by Ball Aerospace & Technologies Corp. in Boulder, Colorado. NASA’s Jet Propulsion Laboratory, a division of the California Institute of Technology in Pasadena, manages the Mars Reconnaissance Orbiter Project for NASA’s Science Mission Directorate, Washington.